DISCLOSURE: Some of the links in this post contain affiliate links. To learn more about my affiliates, please review my disclosure policy here. 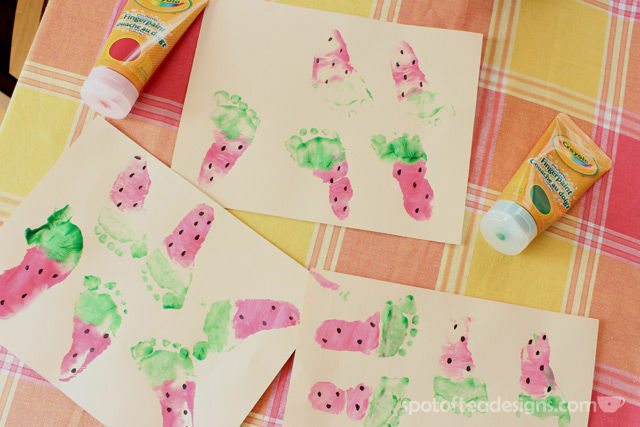 (which you’ve already seen us use for Valentine’s Cards, Mother’s Day Cards and Father’s Day gifts) and make some baby footprint crafts! 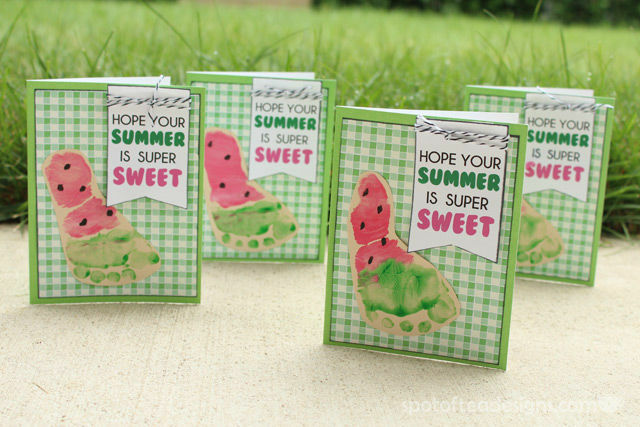 I thought about a sweet juicy watermelon and got to work! My little assistant helped me set up the painting area. We painted on the pink juicy part of the fruit with a regular paintbrush. I mixed in a little white paint with the red to make a nice pink. She was really interested in what mommy was doing here. Next I painted on the green rind of the watermelon. Apparently the foam brush was a lot more ticklish than the regular paintbrush. She was giggling every time I used it. We pressed her foot down onto the paper and made a little footprint. Look at this collection of cute footprints! While they were drying I added some black seeds with some extra acrylic paint. After they dried I added some fun tags at the top with some baker’s twine left over from our wedding crafts and they were all done to be sent out! 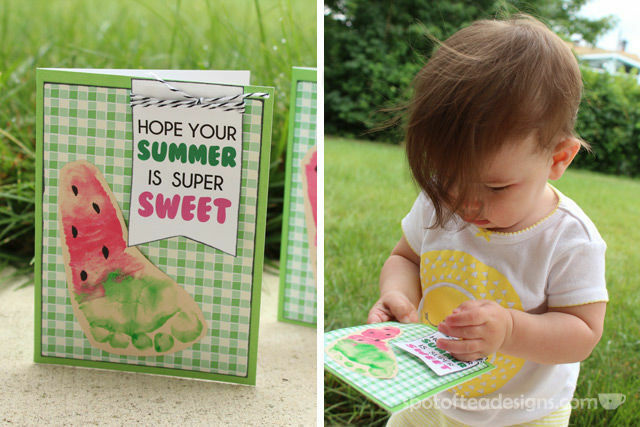 I went ahead and turned the tags into a free printable for your personal use! 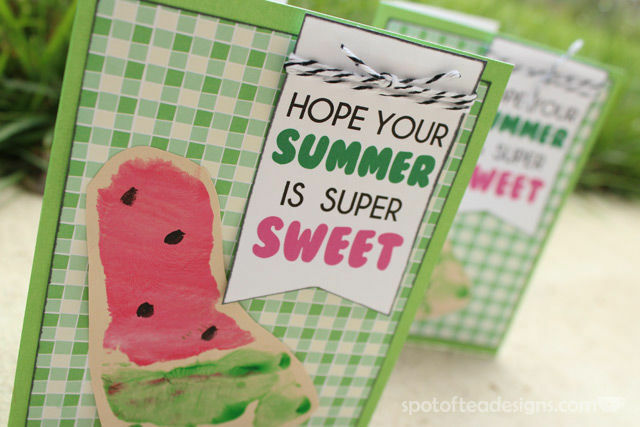 Click the image above to download a 8.5×11 sheet containing 8 of these Sweet Summer Tags! If you do make anything with these tags, I’d love to see it! I’m putting together a “Reader’s Feature” of things readers have made based on posts seen at Spotofteadesigns.com! Email me at spotofteadesign(AT)yahoo(DOT)com! Love these cards. I just pinned and shared on Facebook page. 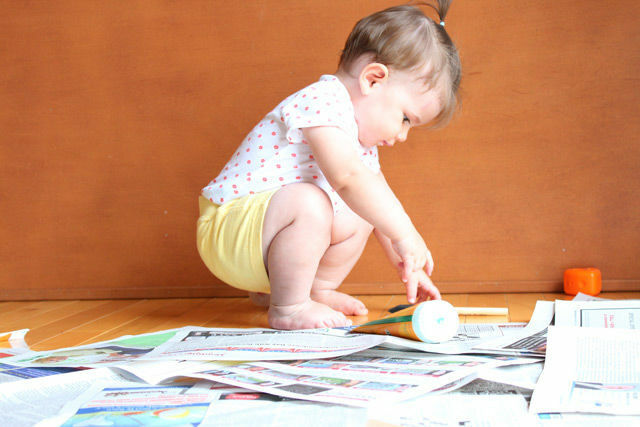 You have great ideas, so excited to be following now :) Enjoy your Sunday!